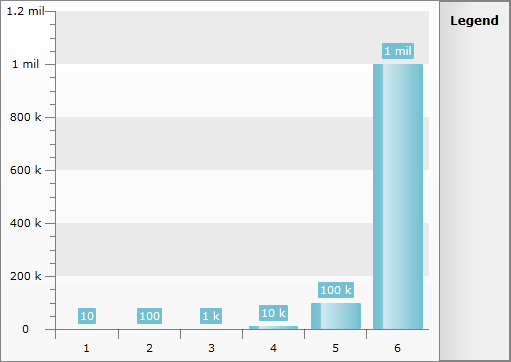 If you have a very large range of values on the Y-Axis, the points with the smallest values may not be easily visible. This is because the scale for the Y-Axis will be linear. In this case you can scale the Y-Axis logarithmically, so there is enough space for each value. The logarithmic scaling is calculated automatically, you just have to set the IsLogarithmic property of the YAxis to True. 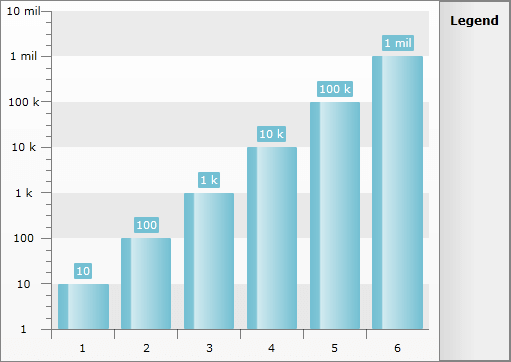 Here is an example of a RadChart that visualizes the following values - 10, 100, 1000, 10000, 100000, 1000000. Here is the same RadChart, but this time with logarithmic Y-Axis. You can use the LogarithmBase property of the AxisY to modify the base on which the logarithmic function for the axis is calculated.